i hope most people know how to make guacamole, but just in case i figured i would relay my own recipe. just as a warning, this guac isn’t exactly the smooth and creamy kind. this guac is the hearty paste made for applying to sandwiches, chips, burritos, and salads. prepare yourself. cut your avocados in half and remove the pit. keep in mind, the key to really good guacamole is the ripeness of your avocados. if they are too ripe, they will be brown and stringy and terrible. if they aren’t ripe enough, they will be hard and difficult to work with. 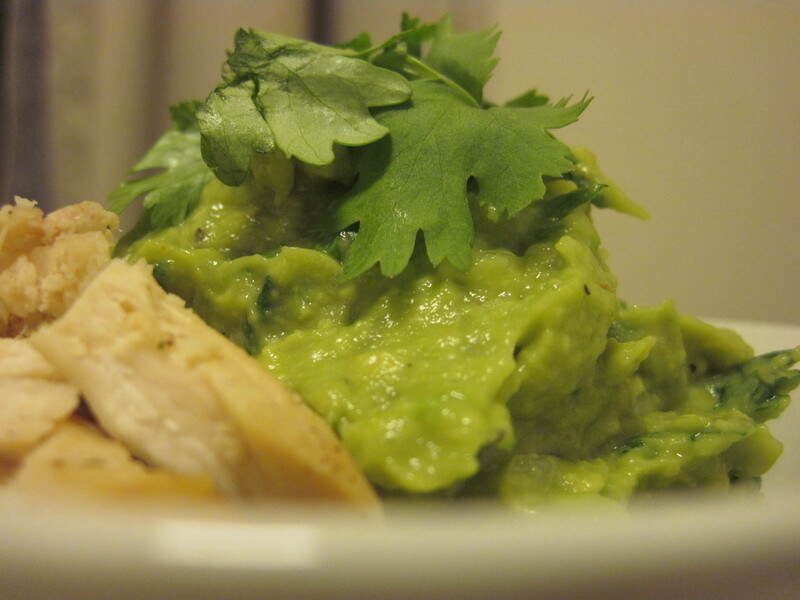 run your knife lengthwise along the flesh of the avocado three times, and then crosswise an additional three times. use a spoon to scoop out the diced flesh into a large mixing bowl. mince your red onion extremely finely. red onion has a more intensely spicy flavor than more other types of onions, so you need to take extraneous measures so as to prevent a dinner guest from getting a mouthful of guac that is more than 50% onion. once finished, add to your mixing bowl. peel a few cloves of garlic and cut off the ends. like the red onion, mince extremely finely. i go heavy on the garlic because i love it, but i will leave that up to you. you can seed and mince your jalapenos right now as well (if you chose to include it). add to the mixing bowl. cut up your tomato into smaller than bit-sized chunks. add a little bit of the juice that escaped to the mixing bowl but do not (i repeat do not) add the tomatoes to the bowl. as tomatoes are the only ingredient on the list that is high in water, if you add them too early (or if you plan to save some of the guacamole for later) they will completely ruin the texture and flavor. a few splashes of lime juice, some shakes of black pepper, a few pinches of salt, and a spoonful or two of queso fresco should render the concoction complete. give it a good mash, but make sure to leave some chunks. smooth guacamole is a little too boring if you ask me. finely mince the leaves of your cilantro, and stir into the guac gently. last, serve the tomatoes alongside your guacamole and allow each dinner guest to select the amount they would like to add one portion at a time. this is a clever way of preserving the mantra, “to each their own.” some people like guacamole without tomatoes, while other like guacamole that is more than 50% tomatoes by volume. snack, chat, and if you feel the need to store the leftovers until tomorrow, remember to add the pit back into the tupperware or saran-wrapped bowl.